After eight years of waiting, Bushmaster ACR fans are finally getting what they want as Bushmaster announced the release of two new caliber conversions. The .450 Bushmaster and the 6.8 Rem SPC II are joining the ACR platform offering caliber conversions. The new set-ups deliver fully ambidextrous controls, better ergonomics, tool-less configuration and a reliable gas pistol operating system. The new additions have made the ACR, “the most field adaptable Modern Sporting Rifle Platform available,” at least according to Bushmaster. The .450 Bushmaster also delivers a 16-inch or 18-inch barrel, depending on preference, with an FNC treated design and 1×24 twist. The .450 Bushmaster delivers a 5-round polymer magazine capacity. The 6.8 Rem SPC II variant features a 16-inch FNC treated barrel with 1×11 twist. The 6.8 Rem SPC II brings in more rounds with a total capacity of 25 rounds. 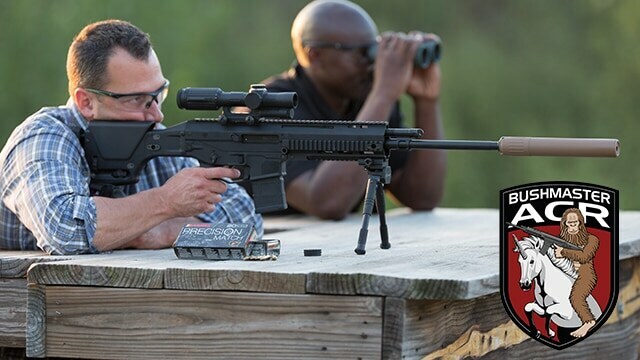 The company said the .450 Bushmaster Conversion is best wielded against deer, bear and feral hogs while the 6.8 Rem SPC II offers increased energy and down-range performance. The Caliber Conversions for the ACR are priced at $699.